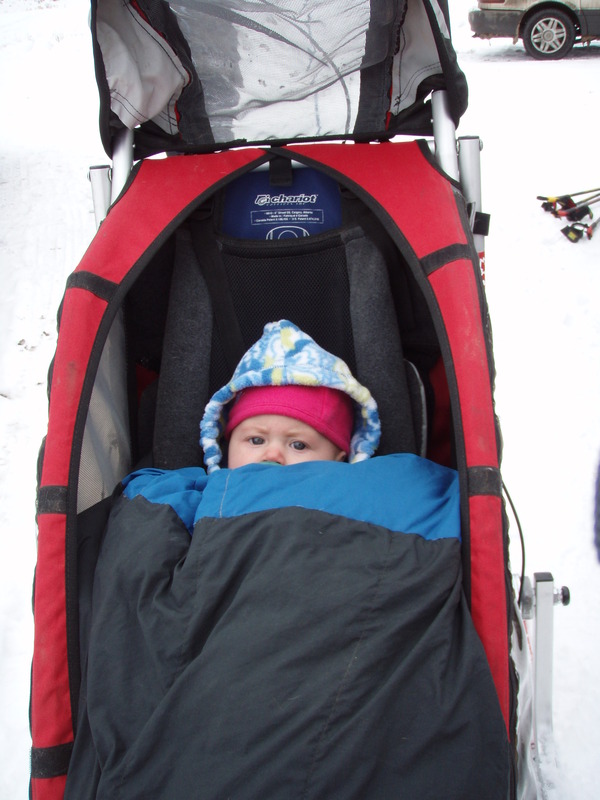 Juniper bundled in the Chariot a few winters ago and still happy to have a ride like this at two and a half. Either I’m starting to become a bit of a wuss or it is very cold so far this winter. I like to think it’s the latter. It took a little extra motivation this morning but Juniper, Joy, Selah and I braved the single digits for a great road run with the Chariots. I’m not sure how we would have done it without Chariots as they are the only jogger that I’m aware of that you can completely protect the child from the elements. With both kids bundled under down jackets with entertainment and snacks, Joy and I were able to enjoy a nice six and a half mile run on a mix of dry, snowy and icy roads. As I’m just over halfway through the sixth month of this pregnancy, I have been starting to think more and more about training with two children in tow. The double Chariot is a must but I also hope I’ll be strong enough to push and pull approximately 50 extra pounds around (and that’s just when the little guy is a newborn). My motivation to get back in shape and play outside should be enough to get me going even if it’s at a bit slower pace than normal. If I can train with all that extra weight, racing should feel like a breeze…right?